Different cultures have different customs and practices about various things and occasions. But one man in China has deeply regretted following his country’s custom after this led to the loss of his brand new car, just hours after he brought it home. The driver was from Yangzhou, Jiangsu province in China. There were other cars available in his country but he wanted a BMW so much that he was willing to pay twice its market value in the US, just to drive on in China. According to reports, he paid nearly half a million yuan (nearly US$80,000) for the vehicle due to taxes and tariffs. When the vehicle finally arrived, we could easily understand why he wanted to celebrate the occasion. 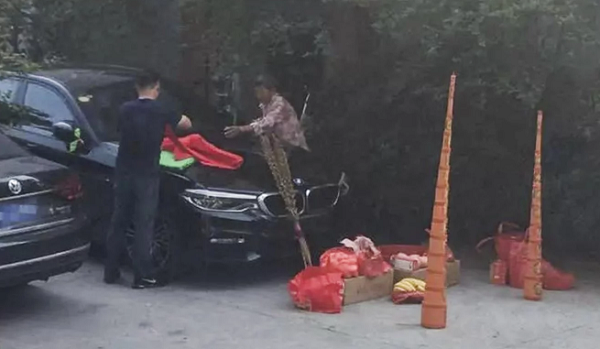 Aside from celebrating the arrival of his brand new car, the unnamed driver decided to burn incense sticks to pray for good luck as well as blessing the car to ensure it will be away from danger and harm. Outside his home, the man and an elderly woman could be seen laying out a red banner over the hood and placing some dishes filled with offerings to the gods. Then, he lit two towers of incense sticks in front of the vehicle. What happened next was just so heartbreaking to watch. “(I) just lit some joss sticks. It was very far (from the car). Twenty minutes later a neighbour told me my car was on fire,” he later explained. Someone called emergency services and the fire was out after around 10 minutes but by then, the damage was too much that the car appears to be beyond repair! Ouch. The fire department told the local media that they are still investigating the incident but believe that the man’s worshipping ceremony burned the car. Duh. 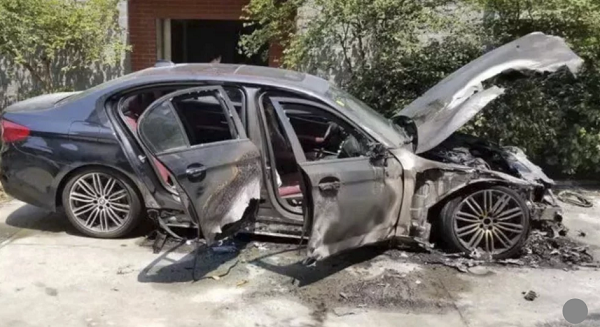 A Chinese man tried to thank the heavens for his new car, but ends up burning his ride – and a big hole in his pocket.